ABOARD THE PAPAL PLANE (Reuters) - Pope Francis has voiced serious doubt about the authenticity of alleged continuing apparitions of the Madonna in Medjugorje, a once-obscure village in Bosnia boosted by the pilgrim business. "These presumed apparitions don't have a lot of value. This I say as a personal opinion," he told reporters on his plane returning on Saturday night from Portugal where he gave the Catholic Church two new child saints. Six children first reported visions of the Virgin Mary in 1981 in a scenario reminiscent of famous apparitions in the French town of Lourdes in the 19th century and 100 years ago in Fatima, which Francis visited on Friday and Saturday. In the following years, the Bosnian village became a major pilgrimage site, giving many visitors a renewed sense of spirituality and locals a steady source of much-needed revenue. It also became the focus of controversy as local Franciscan priests running the site promoted their claims in such open defiance of warnings from the Vatican that some were expelled from the order and the local bishop called them schismatic. Some of the alleged visionaries, now adults, say they still experience apparitions regularly, and that the Madonna tells them ahead of time when she will appear to them. Many say the apparitions are a hoax. Former Pope Benedict set up a commission of theologians and bishops to study the situation. Its report has not been published but was given to Pope Francis in 2014. 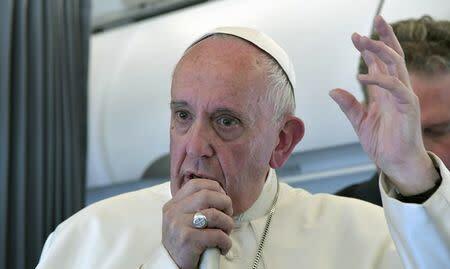 Francis said investigations are continuing into the first alleged apparitions when the reported visionaries were children or teenagers, but again made it clear that he is highly sceptical about today's claims. "The (commission) report has its doubts. I personally am more nasty. I prefer the Madonna as mother, our mother, and not a Madonna who is the head of a telegraph office, who every day sends a message at such-and-such an hour. This is not the Mother of Jesus," he said. "Who thinks that the Madonna says, 'Come tomorrow at this time, and at such time I will deliver a message to that visionary?'" he said. But Francis acknowledged that some people who go to Medjugorje experience a spiritual renewal and "encounter God, change their lives."